Want to save more Money? Call to any Country & to any mobile network With Afghan Telecom fixed line service & cut down your monthly mobile expenses. Talk more & save more…. Lowest calling rates in Afghanistan with Afghan Telecom fixed line service at 0.99 Afs/Min to local calls 2.5Afs/Min & 4.99 Afs/Min to international calls. & cut down your monthly mobile expenses. Talk more & save more…. to local calls 2.5Afs/Min & 4.99 Afs/Min to international calls. Now Afghan Telecom internet price is starting from $96/month in Mbps for large bandwidth requirements. Best broad band speed in Afghanistan through DSL now available in Kabul, Herat, Mazaar-e-Shariff, Kunduz & Kandahar at starting package of 256 KBPS at only 5,00 AFN / Month for unlimited free internet usage. If your Office requires high speed dedicated internet, then choose Afghan Telecom Fiber dedicated internet starting from $96/month per Mb (1MB Download: 1MB Upload). 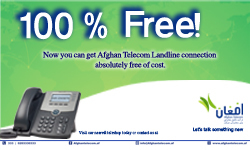 Afghan Telecom the only national PSTN service provider in Afghanistan for Fixed line services at your city. Amazing promotion with Afghan Telecom is to talk to any Afghan Telecom subscribers with different call packages, which launches different type of promotions to suit your life style and provide options to use as per subscribers convenience. Unreliable promotion for getting Digital fixed line. With Afghan Telecom Government telecommunication Company, there’s no need to worry about making costly international calls anymore. International Calling, you can enjoy reduced call and rates to 8 countries 4Afs/Min. Now by paying 250 AFs you can enjoy the unlimited talk time packages on monthly base from AFTEL Digital fixed line to AFTEL Digital phone . don’t wait any more , get the cheapest promotion of unlimited talk time with your friend and family.